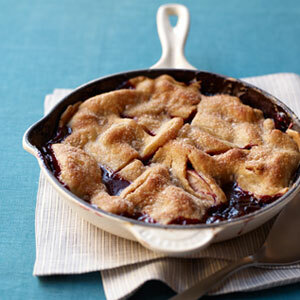 Just one tablespoon of grated ginger creates unbelievable flavor in this unique pie, bringing out the taste of the blackberries and apples. Make it a modern à la mode by using yogurt, crème fraîche or cinnamon-flecked whipped cream. Heat oven to 400°F. In a large bowl, whisk together the cornstarch, salt and 1/4 cup of the sugar. Add the apples and toss to coat. Melt the butter in a large (10- to 12-in.) cast-iron skillet over medium heat. Add the ginger and cook, stirring, until fragrant, 1 to 2 minutes. Add the blackberries and stir to combine. Remove from heat and add the apple mixture, mixing until combined. Lay the pie crust over the fruit, brush with the egg, and sprinkle with the cinnamon and remaining 2 Tbsp sugar. Transfer the skillet to the oven and bake until the crust is golden brown and the fruit is bubbling, 35 to 40 minutes.